Dr. Herstik graduated from the New York College of Podiatric Medicine in 1987 and went on to complete a two-year residency in foot surgery at Kern Hospital for Special Surgery, in Warren, Michigan. He was section chief of Podiatry/Department of Orthopedics at St. Vincent’s Hospital Medical Center. With more than 25 years of experience, Dr. Herstik feels that most foot conditions can be treated conservatively without surgery. However, when needed, he corrects common foot conditions, such as bunions and hammertoes, in either an inpatient or outpatient setting. He believes that counseling and educating parents, helping marathon runners and providing compassionate care to the elderly makes each day unique. 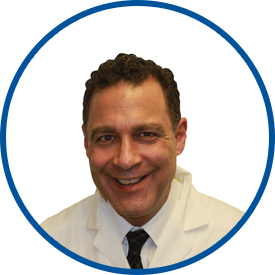 Dr. Herstik enjoys living in Westchester with his wife and three children. Keeping active, healthy and fit is an important part of his lifestyle and a goal he tries to instill in his patients every day. Monsignore Clement Kern Hospital for Spec. Surg. I know *Dr. Herstik from his Manhattan practice, 1999, we have an excellent relationship. Doctoe was very friendly and caring to my daughter. Great experience. I always have very good communication with the doctor. He spends time looking on my feet - informing me that my feet look good and to continue using the cream he has prescribed. I will see him in two months - the appointment was scheduled after I saw the doctor. I received the appointment as requested. Excellent place. *Dr. Herstik is so nice & funny! Such an easy doctor to talk to! Dr. Herstik is excellent and I have been getting excellent results working with him. Dr Herstik is exceptionally kind in caring for my father.